I love disruptive technologies, whether in computers or cars. Anything that shakes the traditional slothful “same as before” but with a different face is worthwhile. That’s why the disruptive electric car and plug-in hybrid technology is reviving a boring industry. But the internal combustion engine has come far the last few years. Look at what Mazda has done with their SkyActiv technology, amongst others. Nissan’s DeltaWing proves to be an even bigger leap of faith pushing the industry forward. After all, conventional wisdom, or lack thereof dictates a set of parallel wheels, a body more or less aerodynamic and an engine to push it as fast, far and with as little fuel as possible. Then Came The Delta Wing. It’s hard to talk about the meaning the DeltaWing has and the potential it holds for the future of racing. In many ways, the DeltaWing is almost the spiritual son of the Colin Chapman years, the brain behind the Lotus philosophy, weight is the enemy of racing. Ridiculed by many as being an exercise in futility, tossed off by journalist experts as a PR stunt, the Nissan DeltaWing came back for a vengeance this weekend at the Petit Le Mans in Atlanta, Georgia to place overall 5th. As with any experiment prototype, the DeltaWing started last on the grid with the number “0” on it out of 42 entries. What happened next was nothing short of spectacular. From last, it passed no less than 8 cars in the opening lap. By the first change of drivers, the Nissan DeltaWing had made it to 8th. By the end of the race, it finished 6th, although the forced exclusion of a P2 car brought the DeltaWing to 5th. Technically Speaking. It looks like a racing version of the Batmobile but weighs half as less as an IndyCar. It also produces half the aerodynamic drag than an IndyCar, uses a tiny 1.6 liter, four-cylinder engine with direct gasoline injection and a turbocharger. On top of that smaller engine, it has an advantage over the competition with a much greater fuel efficiency then the bigger cars it races against. In fact, the DeltaWing produces half of what IndyCars deliver, only 300 hp. The 0 to 60 is achieved in 3.3 seconds and its top speed is shy of 200 mph. What the DeltaWing achieves in terms of performance basically boils down to a lighter weight, better aerodynamics and something else if you’ve observed the pictures. Its strange wheel configuration. Trapezoid Wheel Base. Normal, almost unquestioned logic dictates wheels are set up in a rectangular fashion, two in the front, two in the back almost perfectly aligned. Although I’ve only seen another intriguing concept decades ago with the driving wheels in the middle of the chassis on the outside, leaving one wheel in the front and back for steering, the DeltaWing innovates on traditional racing wisdom and disrupts traditional thinking. 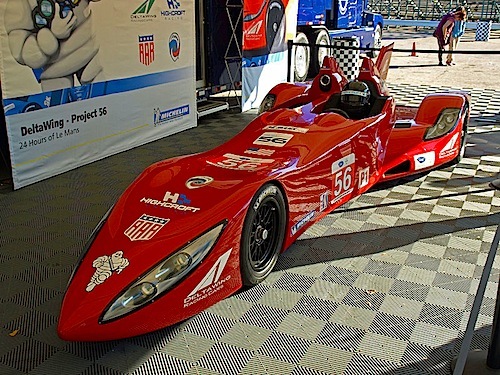 Designed by Ben Bowlby, the DeltaWing aimed to reduce aerodynamic drag dramatically and allow for faster straight and cornering speed. What it also achieves is half as much weight, engine power and fuel consumption, an important factor to winning races. See a parallel with everyday cars here? With its narrow 2 ft front track and its more traditional 5 ft 7 in rear track, the racer lacks front or rear wings. Instead, it uses downforce from its underbody. Weighing in at 1,050 lb with a power-to-weight ratio of 631 brake horsepower per ton, its drag coefficient is of 0.35, much better than any modern racers. To put it into perspective, the braking system weighs 29.2 lb, half the normal weight for a race car. The DeltaWing is 72.5% of its mass and 76% of the downforce is placed at the rear, which explains the ridiculously small wheels in the front. The DeltaWing is much more than a simple design exercise, it’s a window into the future of racing. If racing and the general automobile landscape have got you yawning, as I know it did for me the past decades, Nissan’s DeltaWing and the myriad of alternative energy cars today can only rekindle excitement.